A note sent home with a class of children from an elementary school in Lexington, Kentucky has upset some parents. The bathroom break dilemma happened at Deep Springs Elementary on Wednesday. 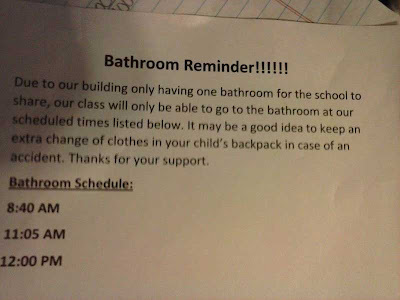 A note was sent home with a class of kindergartners stating "Bathroom Reminder!!! Due to our building only having one bathroom for the school to share, our class will only be able to go to the bathroom at our scheduled times listed below. It may be a good idea to keep an extra change of clothes in your child's backpack in case of an accident. Thank you for your support." Then it stated that the bathroom schedule was 8:40am. 11:05am and 12:00pm. Kyra Fobear is one of many parents outraged by the letter sent home from school with her six-year-old. "We got this note stating that the kids were only allowed to go to the bathroom three times a day, and they couldn't go any other time due to there only being one restroom," said Fobear. School officials later said the note was a complete misrepresentation of the school, and the letter was poorly worded. They said despite the construction, there are plenty of bathrooms for students. The school district said classrooms with younger children do have scheduled times to go to the bathroom, however the children are welcome to go whenever they have to. Fobear said she's angry the note made it home at all. Now she plans to send her kindergartner back to school with a new lesson. "I told her if she has to go, then you have to go," said Fobear. 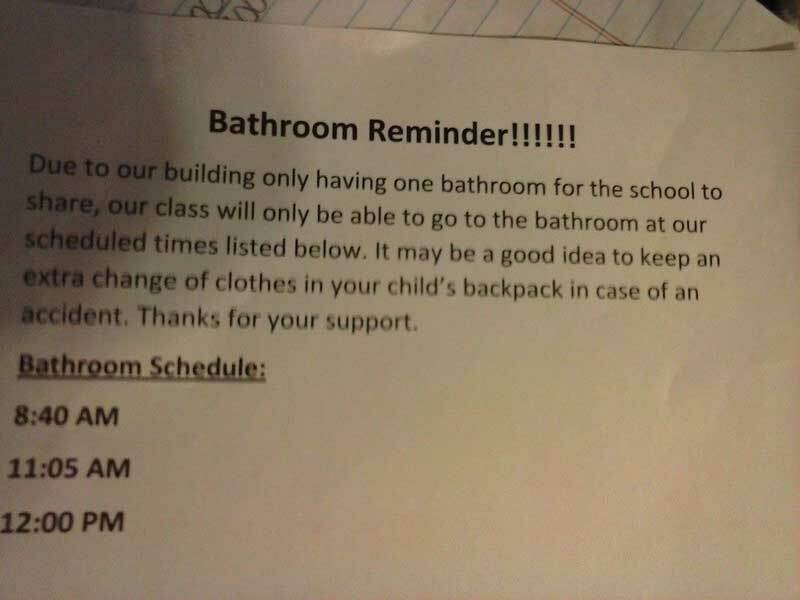 The school district said they plan to call all of the parents who received the note and let them know there are no bathroom restrictions.